Book 2: Meg Daniels Spends a Winter Weekend in Cape May, New Jersey. 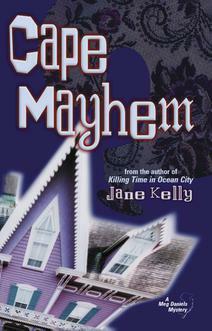 In Cape Mayhem, Meg Daniels arrives in Cape May, New Jersey, for what should have been a romantic off-season weekend for two -- alone. Though unattached, Meg's courtship with trouble is in high gear. It seems that, overnight, a guest at the Parsonage Bed & Breakfast has undergone an impossible transformation. Suspecting foul play, Meg enlists a lively cast of characters to help her solve the problem that only she sees.